Intel’s latest processor series has arrived, and we’re looking to find out if it becomes the company’s greatest. Compared to Intel’s latest mainstream part, Haswell, IV-E avails a quad-channel memory controller, a far more robust PCIe configuration, and the only place to get six-core parts. Are there other perks to be found? Let’s find out. This coming March, Techgage will turn 9-years-old. 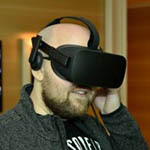 In all the time the site has been around, we’ve taken a look at a countless number of processors from both AMD and Intel, and generally speaking, the process for reviewing a new one – especially one with a new architecture – has largely been the same: A) Benchmark; B) Stare in awe at the improved performance; C) Convert that excitement into words; D) Profit. I’d love nothing more than to be able to say that the trend will continue with Intel’s just-released Ivy Bridge-E based processors, but the fact of the matter is, even Intel itself knew that it was going to be a hard sell. It had to have. When Intel released its Sandy Bridge-E processors two years ago, I was left impressed overall with what it offered over the previous generation, but I mentioned in the conclusion that many “were hoping that Sandy Bridge-E would launch with eight cores” – and of course, it didn’t. It seemed to be a sure thing, then, that two years later, its successor would ship with those coveted eight cores. But not so. In its press slides, Intel states that compared to Sandy Bridge-E, Ivy Bridge-E should be about 4% faster for “everyday computing”, 7% faster for 3D gaming, 5% faster for financial analysis and 10% faster for 3D modeling. This type of performance increase is what we’d expect to see from a speed-boost product – not a new architecture being released two years after the last. The problem is further highlighted by a comparison of the Core i7-4960X that can be seen below, involving the top-end Haswell part released this past summer, the Core i7-4770K. For the first time that I can recall ever seeing from a launch of an enthusiast-class CPU, it’s being noted that “everyday computing” is 18% lower. This is thanks to Haswell’s increased instructions-per-clock and single-threaded performance, but is that what you’d expect to see from a $1,000 processor versus a $339 one? 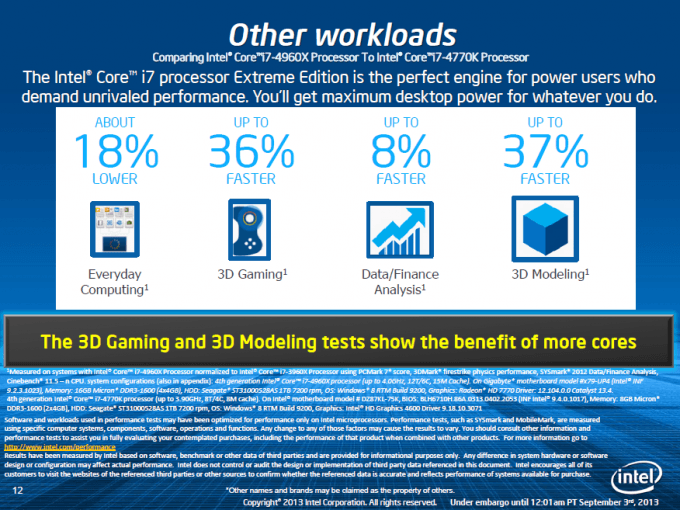 Despite that bizarre “lower” result listed in the slide above, the benefits a CPU like the 4960X do offer is that it can improve 3D gaming (though the result here is unrealistic outside of a benchmark), crunch numbers faster and of course, prove far more efficient at 3D work (and of course, video work, though it’s not mentioned). The X79 platform offers a couple of important benefits over something like the Z87 as well, such as an improved number of PCI Express lanes, which is important for those running higher-end multi-GPU setups. We’re not dealing with a mere bandwidth limitation here, but rather an electrical one. On Z87, dual GPUs will give you an x8 / x8 PCIe configuration; on X79, it’d be x16 / x16. With additional chips on the motherboard, it could be x16 / x16 / x16 / x16 for a quad-GPU configuration, as is possible with our ASUS P9X79-E WS motherboard. A rather significant perk for those who need it is increased memory bandwidth. At the same RAM speeds, going from a 4x DIMM configuration on Z87 to a 4x one on X79 could almost double the throughput. For most enthusiasts, this isn’t a benefit they can enjoy and experience, but for those opting for X79 for multimedia or workstation purposes, it certainly could. Compared to Intel’s latest Z87 platform, X79 is looking long in the tooth, so it’s almost amazing that the company didn’t update things and push out an X89 chipset. Sure – the backwards compatibility is very-much appreciated (a rarity from Intel nowadays), but while Z87 natively supports 6x SATA 6Gbit/s and 6x USB 3.0, X79 supports 2x SATA 6Gbit/s and 0x USB 3.0 – yes, (Zero)x. To get around this lacking functionality, motherboard vendors implement chipsets from places like ASMedia and Marvell to bump up the number of supported ports. With the P9X79-E WS we’re using, ASUS bumped up the number of ports to 6x SATA 6Gbit/s and 4x USB 3.0 – a great thing, but again, there are caveats. As far as performance goes on either these SATA or USB connectors, Intel has the performance crown locked-down. So by using ASMedia and Marvell, you’re actually using weaker-performing ports than those folks that are using a Z87 platform (a platform, that I must remind you, costs way less). As a quick summary, the clear benefits Ivy Bridge-E avail vs. Haswell include a quad-channel memory controller, and a more robust PCIe configuration. The things that lack vs. Haswell include lower instruction-per-clock performance, fewer native SATA and USB ports, and of course, the fantastic power-related improvements that came with that architecture – but admittedly, those looking to build a six-core powerhouse might not be too concerned about that. All models are built on a 22nm process, and utilize 3D tri-gate transistors. None provide cookies. Intel is offering three different Ivy Bridge-E models to choose from, with all three comfortably being considered “high-end”. 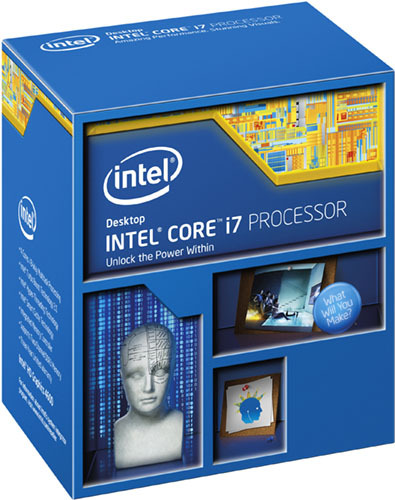 The Core i7-4820K is best comparable to the Haswell-based Core i7-4770K, and surprisingly, despite costing $16 less, it offers a modest clock boost and a 25% increase to cache. On the six-core front, the Core i7-4960X we’re looking at here is clocked at 100MHz higher than last gen’s Core i7-3970X, and commands a $1,000 price tag. For those wanting to save their wallet a bit of stress, the i7-4930X is clocked at 200MHz less, and with 80% of the cache, and can be had for $583. It’s worth noting that the quad-core Sandy Bridge-E model was not an unlocked part. 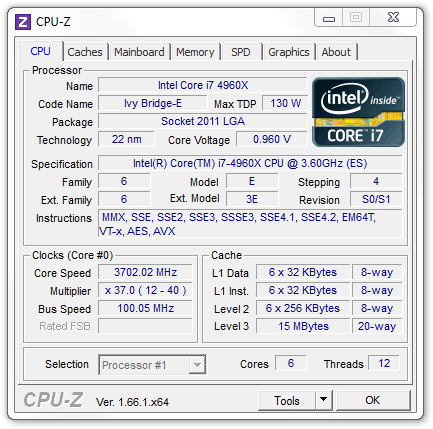 The quad-core model with Ivy Bridge-E is. Kudos to Intel for that change. This means that every single one of the Sandy Bridge-E models available are ready to be poked and prodded for overclocking with no limitations whatsoever (well, except for the top-end limit of the chip, of course). As should be clear by this point, the Core i7-4960X is a bit of an odd chip, but now it’s time to see how it actually performs, both compared to the last-gen Core i7-3970X – which it replaces – and also the Haswell i7-4770K.